One of the biggest enterprises I got involved with as editor of Motor Boats Monthly magazine was to take the company Sealine F36 Missing Link on a circumnavigation of the UK which also touched on several near continental countries. The magazine had only just moved to IPC Media's offices in London and the 147-day trip had been planned in just six weeks prior to departure, not over the whole winter as originally intended. Subsequent reports filled 12 rather long articles in the magazine but I also posted a daily report on the magazine's fledgling website. Many of those reports were subsequently damaged in a data migration exercise a few years later. I'll be aiming to add the original raw files back on here, if for no other reason than self-indulgence. 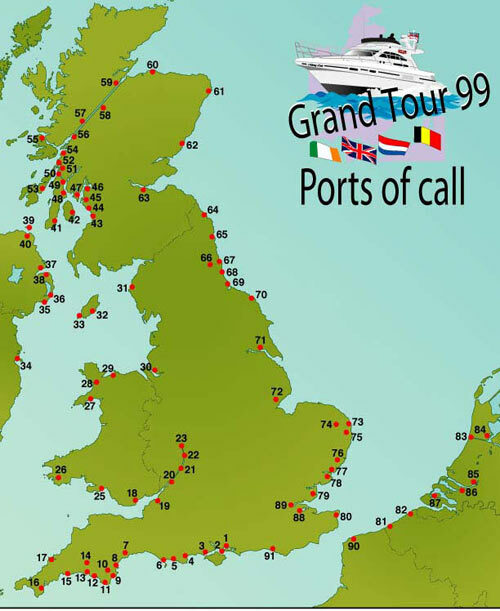 The map outlining our ports of call is below and you'll see links to each of the relevant pages that have been loaded so far (more to follow).